them feel close to someone they have lost with a beautyfull crafted memory bear. 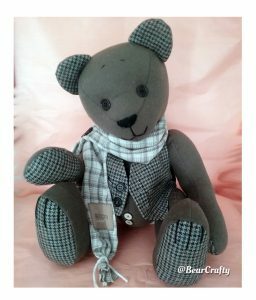 To create your bear, send a favorite shirt, blanket, or article of clothing to Bearcrafty. We will turn it into a beautyfull unique designed bear. It is heartwarming to see what happens when we can actually hold something that connects us to someone we have lost. or a lost beloved one’s shirt to a unique memory bear you can cherish forever? Bearcrafty create the most unique memory/keep sake bears you have seen. What is an memory bear? 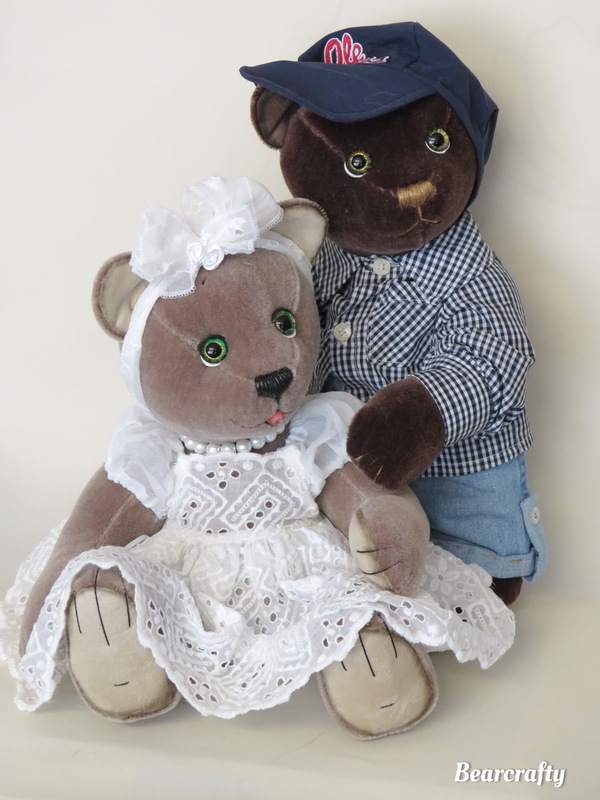 Memory Bears are teddy bears made from clothing and belongings with sentimental value to you. Clothing includes knitted sweaters, bedcoats, wedding gown, uniforms, t shirts, pants and much more. Memory Bears are usually made in remembrance of a loved one or as a keepsake to pass from one generation to another. In making a memory bear, old clothes are transformed into a beautiful and comforting bear. Memory Bears make excellent Sympathy Gifts, Memorial Gifts and Bereavement Gifts. During times of loss and grief, they can offer great comfort. What is an keepsake Bear? Keepsake Bears are teddy bears made from clothing as a way to remember special  times in our lives. They are a wonderful way to put to use all of those stored away baby clothes and baby grows, or other loved one’s clothing, that otherwise would not be seen or enjoyed like that amazing wedding gown, prom dress, schooluniform, and any other clothing who keep a special memory in are hearts. I bought a bear and I must admit I'm in love. I can't stop looking at him and the artwork is amazing. You can see how much time and love goes into these bears. I'm always looking out for more bears now. Can't wait to see what s created for the show in November. I will be taking a trip there hopefully to buy a new addition. My bear arrived today. I am in love with him. He is for my sons 1 birthday made from his newborn clothes. The design and quality is excellent. The communication from start to finish has been great. I would highly recommend. My  bears are NOT designed or intended for use as a toy as they are decorative keepsakes. and accordingly do not comply with any toy safety guidelines and are not deemed safe for use as a toy by Law. They are not designed or intended for use in play by children under 14 years of age. 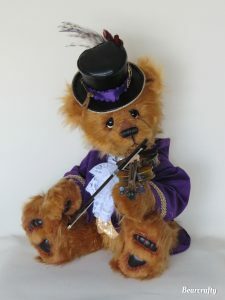 Each keepsake is double-stitched with utmost care and attention with a home sewing machine some detailing is finished by hand, ’ limbs are cotterpin jointed, glass eyes are used and often beads and or buttons that can cost swallow hazzards if they come off  . BearCrafty Customs does not accept any liability for the misuse of these decorative keepsakes. Copyright © 2018 BearCrafty All rights reserved.